Word came late yesterday that the FBI has expanded its probe of Hillary Clinton's mishandling of classified files. Commenting at Yahoo News, commenter David proffers a fairly comprehensive list of Clinton's email lies, any one of which would have landed you or I a full-time gig at Leavenworth breaking rocks. Candidate Clinton lies so very often as to make it seem policy. This is unacceptable to many independents, like myself, who will never vote for her. We all deserve a better President than this. 1) She lied about when she started using the server. 2) She lied about why she needed the server (several times). 3) She lied about there being no classified information on the server. 4) She lied about why and when the State Department asked to turn over the server. 5) She lied about deleting no work related e-mails and deleted them while under subpoena. Blumenthal emails pertaining to Libya and other classified info from Blumenthal were deleted and not included in her work emails that were turned over. 7) She lied (to Congress, under oath) about turning over all the Benghazi related e-mails. There is still a 5-month gap in her missing e-mails that conveniently includes the time period before and after the attack on the U.S. embassy in Benghazi. 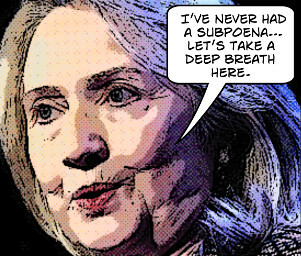 8) She lied about the server having been wiped -- and deleted e-mails while under subpoena. 9) She lied about Canadian Law restricting her from turning over the names of the foreign contributors who turned over hundreds of millions of dollars to their Foundation. 10) She lied about not having any hand in the sorting of the e-mails. In August she said, "So we went through a painstaking process and turned over 55,000 pages of anything we thought could be work-related. Under the law, that decision is made by the official. I was the official. I made those decisions, and as I just said, over 1,200 of the emails have already been deemed not work-related.” She said this personally in response to a question by Ed Henry. 11) She lied about how "secure" the server was. We now know that it had numerous vulnerabilities that included ones that even amateur hackers could have breezed right through. 12) Clinton, speaking on communications between US personnel in Libya and the State Department in Washington, said “there was a good back and forth about security” at the Benghazi compound before the attack that killed Ambassador Chris Stevens and three other Americans. The facts say otherwise. The independent review Clinton convened after the attacks deeply faulted State Department officials in Washington for poor communication and cooperation as diplomats in Libya pressed for more security and Benghazi grew more dangerous. The review board, however, said “Washington showed a tendency to overemphasize the positive impact of physical security upgrades” to a “profoundly weak” system. At the same time, Washington officials were “generally failing to meet Benghazi’s repeated requests” to augment security personnel. 13) Clinton said “there was a lot of conflicting information” about who was behind the attacks, in an effort to defend early attempts to link the violence to YouTube videos and other factors. The facts say otherwise. Ohio Rep. Jim Jordan produced an email Clinton sent to her daughter, Chelsea, the night of the attack where Clinton said it had been committed by al-Qaeda-linked terrorists. And in a conversation with the Egyptian prime minister the next day, Clinton said she knew the online videos had nothing to do with the violence, and that it was a planned attack. “State Department experts knew the truth, you knew the truth, but that’s not what the American people got,” Jordan said. The facts say otherwise. Clinton was mischaracterizing some of those exchanges with Blumenthal. Benghazi Committee Chair Trey Gowdy asked what she meant by saying his advice was unsolicited. “I did not ask him to send me the information that he sent me,” Clinton said. Clinton sent about one-third of her emails during working hours — on weekdays between 8 a.m. and 6 p.m. — according to an AP analysis of 2,754 emails she wrote from April 2009 through September 2010, based on time stamps on the messages. 16) She claimed that the State Department "had between 90 and 95 percent of all [her] work-related emails" even before she turned over 54,000 pages of records last December. "I'm not aware that we have given that figure," State spokesman Mark Toner told reporters on Friday. "We've not been able to confirm that." 17) When Republicans tried to buttonhole Clinton because State declined numerous requests for additional security at the Benghazi compound that was later over-run, Clinton largely waved them off. Those requests for more protection, she argued several times that day, went to people who deal with security — not her, personally. Are Obama/Jarrett sending some kind of message?